I am honored to be joined today by Ms. Jennifer Heller, the President and Chief Investment Officer of Brandywine Group Advisors, a $10B New York City based family trust advisory firm. 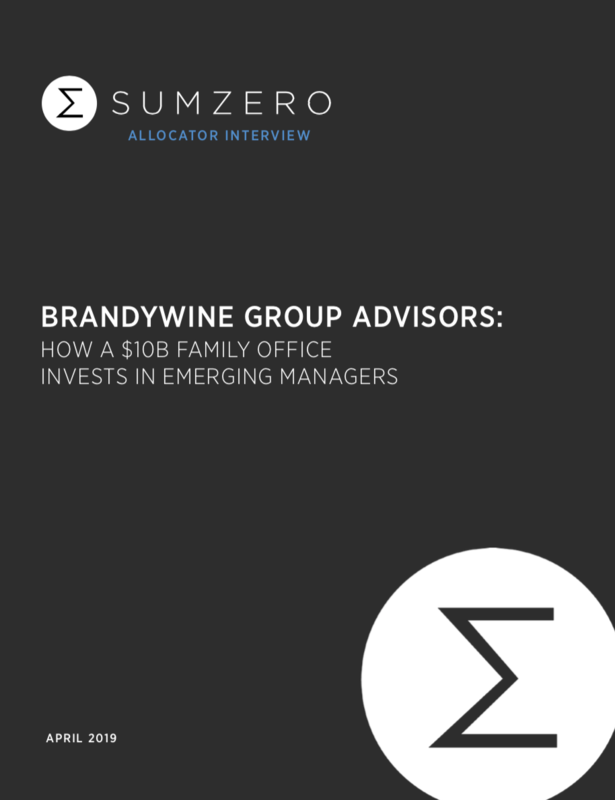 The Brandywine team is a long-standing allocator member of SumZero’s Cap Intro program. Ms. Heller joined Brandywine Group Advisors as its President and Chief Investment Officer in 2012. Previously, Ms. Heller served as an Investment Director at the Alfred P. Sloan Foundation. Ms. Heller began her investing career at the Stanford Management Company. Prior to Stanford, she worked in investment banking at Merrill Lynch. 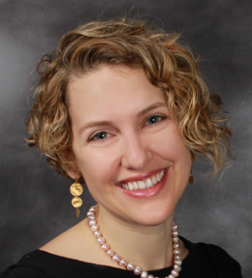 Ms. Heller is founder of the Endowment, Foundation, and Family Office Professionals Network. Ms. Heller earned her M.B.A. and her Public Management certificate from Stanford University’s Graduate School of Business, and her B.A. in Political Economy from Williams College. She serves on the Williams College’s Investment Advisory Committee and the Stanford Business School Trust. She is a CFA charterholder. Nicholas Kapur, SumZero: It is an honor to chat with you, Jennifer. Thank you sincerely for taking the time. You have worked with a number of well-known institutions that allocate capital in different ways. Where and when did you start to look at emerging managers, specifically? Jennifer Heller, Brandywine Group Advisors: My mentor and former boss, Bill Petersen, had a knack for identifying and nurturing young talent. It was part of our culture at the Sloan Foundation to spend time with managers who were a bit below the radar, and I was always encouraged to take these meetings. I found a couple of first time managers right after the GFC who were doing really interesting work in structured credit. We were able to negotiate aligned terms with them, we were the first institutional money in, and the investments worked out really well, so this was an early way to build my confidence in investing with folks who hadn’t built independent track records yet, but who were hungry, smart, and creative. I also recognized the value of building a deeper level of partnership with these young managers than we could with larger, better established firms (especially at our size). Of course, not all of my emerging manager investments have worked out as well as these initial two! We are all colored by our early experiences and I’m glad mine were so positive. NK: To that point, a consistent theme in my research on Brandywine has been a heavy emphasis on the long-term as it relates to investment horizon. One thing I wonder about is how you embrace that perspective and still maintain readiness to strike when the window to act is short? How do you minimize time-sensitive errors of omission? JH: Our long-term view does mean that we like to take our time on the front end to get to know a manager prior to partnering with them, as we want these partnerships to be durable and long-lasting. While we are capable of completing extensive diligence on a relatively short time frame, and we will do so on occasion to meet a tight deadline, it is not our preferred modus operandi. I worry much more about mistakes of commission than omission. This means that there will be dollars out there that are not ours to make. There are great funds in which we won’t invest, and likely compelling short-term tactical opportunities in which we won’t participate, because I will always prioritize making fewer, high quality, consequential decisions over trying to tackle everything. This isn’t to say we aren’t opportunistic when warranted. 1) We can co-invest with managers with just a few days notice if the co-investment fits our framework. 2) We keep our eyes and ears close to the ground, looking for areas of substantial dislocation which might be worthy of more tactical, point-in-time investments. 3) We also have cultivated some relationships with managers whom we’ve underwritten up front to be opportunistic on our behalf. For example, we have a bespoke relationship with a manager who, every few years, will find an industry undergoing structural change and purchase the “fulchrum company” (e.g. the survivor) in the industry. We invest alongside him, often in 1-2 deeply distressed equities with a highly asymmetric risk/return profile, when these opportunities arise. NK: I am curious where that manager is headed next. In a piece you wrote about design-based thinking several years back, you said “good investing begins and ends with people”. I wonder: Given the run that active management has had of late versus passive management, has your perspective on this subject changed at all? JH: I absolutely believe that good investing begins and ends with people, and also that passive investing can play an important role in a portfolio. The two are in no ways mutually exclusive. When evaluating any active manager, we ask ourselves what we need to believe, given their fee structure, tax efficiency, about their ability to produce enough excess return over their underlying market exposure to earn a spot in the portfolio. A substantial portion of the work of understanding whether generating that level of outperformance is realistic comes down to evaluating the people making the investments. A meaningful part of our analysis is to deeply understand with whom we are partnering: how they view themselves as fiduciaries, how they engage with each other and with external parties, what motivates them, how aligned their success is with our own. These questions begin and end with people. NK: You mentioned that your firm evaluates the quality of capital invested in a manager’s fund. This is not uncommon and given the impact transient money can have on fund performance, it makes good sense why. But I also think it puts emerging managers between a rock and a hard place. Many managers are subscale and are financing their business (and their lives) with personal savings. When a check presents itself that may not be glamorous or ‘sticky’ but does help the manager build a sustainable business, it creates a paradoxical situation for them. What advice would you offer? JH: We are willing to be, and have been, the first money into a fund so I wouldn’t say the quality of capital is a deal breaker for us, and I certainly don’t expect new funds to have a line of “blue chip” investors out the door! We focus on this attribute more for established funds just to gain an understanding of how they’ve built their capital base (and why), and to ensure we are relatively aligned with their other investors. In terms of advice, fast capital, while seductive, does not help build a sustainable business from my perspective. I’ve heard many sob stories from managers who were impatient about building their capital base, then had a bad year or two early on and had to deal with the headache of 1) quick redemptions and 2) monthly calls (or worse) from nervous investors who either faced external pressure or didn’t do appropriate homework up front. This doesn’t mean that the initial investor base must be full of fancy names. But if a manager can afford to have the patience to find investors who truly understand the strategy and its inherent risks, and who have a demonstrated record of living through volatility with other funds, it can help them create a sustainable business longer term. These types of investors can be found across the LP universe. NK: Your paper “Learning to Listen” is an insightful thought-piece on how individuals can cultivate stronger retention and listening skills. One of the strategies you mention is an attention to body-language and other non-verbal clues when evaluating managers. You hilariously cite one case in which a partner of a fund eye-rolls at the statements of another partner in the middle of a pitch meeting--wow. How do you weed out some of the more subjective elements of this kind of observational process (e.g. biases toward likability, attractiveness, similarness, etc.) versus the substance of it (e.g. eye-rolling your partner)? I would observe that we’re often drawn to folks who are a bit quirky in nature, perhaps because it speaks to our own quirkiness… I’m ok with this bias, as I think we can and have found some promising investors who might not relish the process of selling themselves. Finally, deep listening and inquiry isn’t simply about watching someone for an eye roll. It’s about being fully present during your conversation with him or her so that you can hear the context behind the words. NK: In your terrific Capital Allocators podcast with Ted Seides, you talk a bit about the leap an analyst needs to make to become a ‘trigger-puller’ in order to manage a fund. Let’s dig into that. What are some tell-tales of an investor who might actually be better off staying as the ‘idea-generator’ in your experience? • The willingness and ability to take risk, and to manage risk—very different things, both equally important. • The willingness and ability to construct a portfolio. • The willingness and ability to wear your performance on your sleeve, every day/night, and not go crazy. Judgment is hard to develop, however, without being a trigger-puller, as experience is the best teacher. An analyst with a high degree of self-awareness and a relentless need to improve herself and her process is probably on the right track. • A deep desire to be an entrepreneur. • The willingness and ability to manage at least a small team. • The willingness and ability to manage a business—deal with investors, manage P&L, set up back office/operational capabilities. An investor who doesn’t have the desire or ability to do ALL of the above is probably better off staying an idea-generator. NK: Speaking of self-awareness, you mentioned that your selection process delves deeply into a manager’s understanding of the ‘why’ in his/her past performance, i.e. evaluating the rationale behind decision-making. We know that memory recall is notoriously inaccurate, and part of the reason SumZero exists is to create that open-record and mitigate the biases that degrade/distort memory over time. How does your team handle the problem when such a record does not exist? JH: To ensure a relatively high level of recall and intellectual honesty in internal decision making, we try to keep a written record of as many points in our decision making process as possible. This includes taking really detailed notes at meetings, and keeping a written record of all our decision points so that we can evaluate them later. This allows us to compare what we thought we knew vs what happened, and write more accurate post-mortems when decisions don’t work out as we’d expected. When evaluating new managers, we spend substantial time discussing past decisions at prior firms, then referencing what we hear against a reality we have to try and construct from references/public data/whatever we can gather. If we can’t get a pretty good sense of the why, we can’t invest. NK: A concept that comes up frequently in your writings is ‘empathy’ and using it as a tool to more deeply understand the manager you are investing in. For a little fun, let’s invert that: What do you think managers could learn about you if they put themselves if your shoes? JH: They would learn how seriously I take my job as a fiduciary, and better appreciate that when my team and I push for information or better terms, it is always with the best of intentions and with our families’ interests front and center. They would learn that I really love what I do, that I view this work and my job as a privilege, and that coming to the office is a joy for me. They would also learn that I struggle constantly with trying to balance my life, that I live with a constant, low-grade anxiety about what I could be doing better or differently, and that my greatest respite, aside from my family and closest friends, is found in the mountains. NK: Final question here and the one I ask of all the allocators I chat with: What advice would you give to someone considering the launch of a new fund? What do you think is the most important thing these individuals can do to increase the chances of them being a viable partner for a prestigious institution like Brandywine? 1) Operate with total integrity. 2) Possess deep fluency in your chosen area of expertise. I would expand this a bit—possess the ability to learn quickly, a rage to achieve mastery, and an understanding of your power zone. 3) Create a fair fee structure. 4) Make sure you have a long runway ahead of you and can do what you do for decades—personally, professionally, and in terms of the opportunity set(s) you seek. 5) Find an uncrowded space—not so easy to do these days!